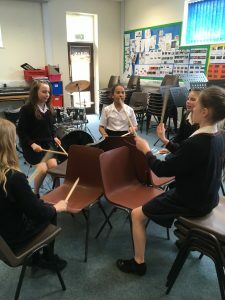 We’re always pleased to hear from teachers about the music-making taking place in their schools so we were delighted to hear from Richard Garbett, Head of Music at Spalding High School. 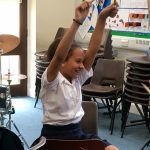 Richard wrote to us last week to tell us about Musical Futures at his school and the impact he feels it has had on the profile of music in his school with the increase in student participation at Year 9 and Key Stage 4. “I thought I would send you an email to let you know about Musical Futures at Spalding High School in Lincolnshire. 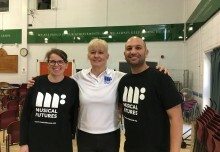 Since taking over as Head of Music, and the only music teacher at Spalding High School in Lincolnshire last year, I have implemented a full musical futures programme for the whole of key stage 3. This initially began by taking The Passenger transition project into two local primary schools and then planning to continue it into Year 7. This was a fantastic opportunity to get the whole of Year 7 involved, and even those who had not gone through the transition visits were more than happy to take it all on board. Six weeks later we had performed it in assembly and at a Year 6 information day, and it was also included in our Christmas Concert with the School Orchestra providing the accompaniment. I decided that the rest of KS3 needed Musical Futures and so began a year of MF projects, encompassing Classroom Workshopping, Band Instrumental work, Find Your Voice, song writing and chair drumming. 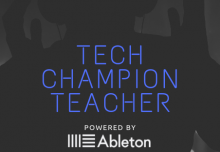 Some of these projects naturally feed into live performances and some of my Y7 chair drummers even worked out and performe d a solo in the middle of an orchestral version of Another One Bites the Dust in the last concert of the year. The programme and whole ethos of MF has proved to be immensely successful and has been thoroughly enjoyed by myself and all of my students. Our Year 8 students have to choose music as an option to take in year 9 and this year I have seen 100% increase in the number of students opting to take music in year 9. I also have 100% increase in students moving on to opt for GCSE music! Such is the success that I now have another member of staff having to teach some music as I cannot teach it all by myself due to the increased numbers in Year 9. 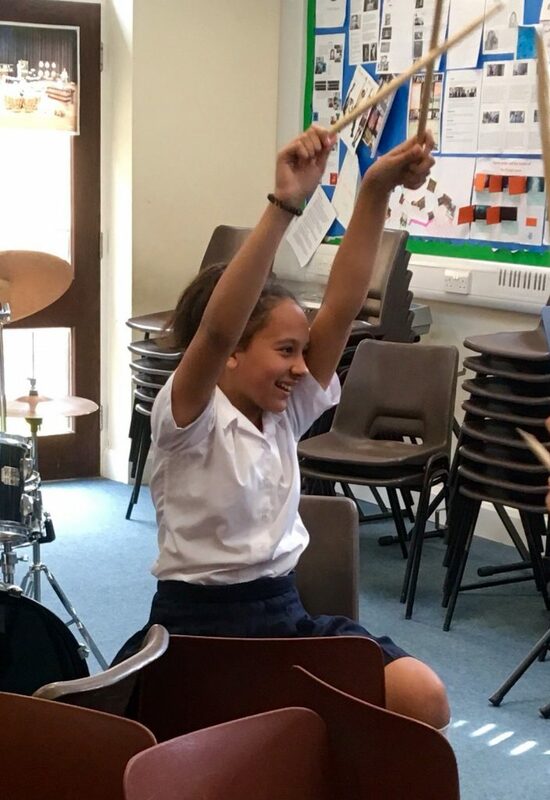 The highly practical and creative approach is thrilling and is what Music should be all about – I now have students of all years coming in to practise their projects before school, at break time and sometimes even after school, entirely of their own volition. 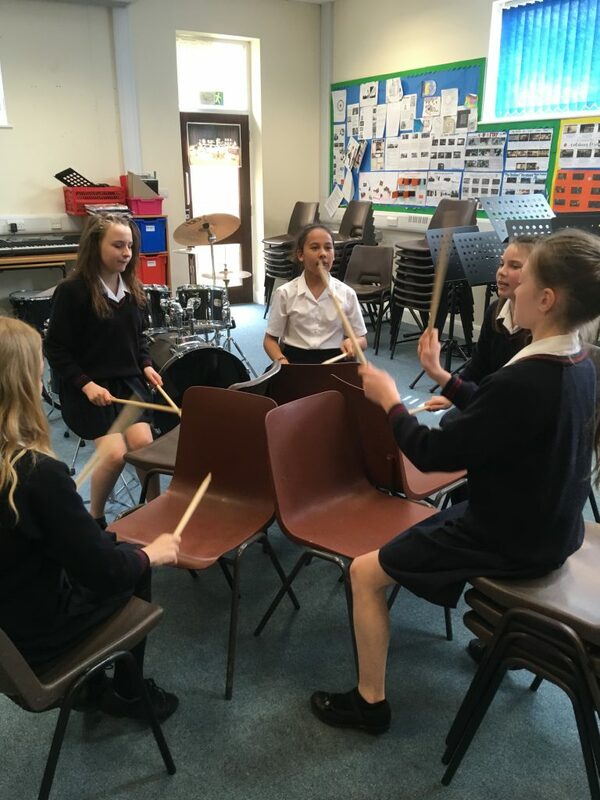 Each lesson is started with rhythmic or vocal warm ups – now affectionately known amongst KS3 as ‘Circle Time’ and this has also led to an increased number of students participating in extra-curricular ensembles and concerts. Next in the pipe line is the incorporation of MF ideology into KS4, something I began doing at certain points last year. All #ShareYourMFStory contributions featured on our website or social media channels will receive a free playalong resource of your choice. 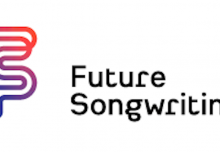 Submission of a #ShareYourMFStory contribution does not guarantee publication – all contributions selected to feature on the Musical Futures website or social media channels are the decision of the Musical Futures Team. All pictures/videos accompanying #ShareYourMFStory contributions must be cleared for photo permissions for use on our website or social media channels.